‘Rammed earth’ is a technique for constructing foundations, floors and walls from natural raw materials such as earth, chalk, lime or gravel. 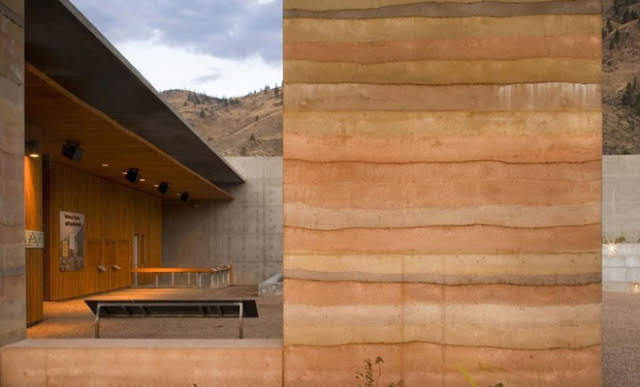 With the lowest enviromental impact of all building techniques currently used in the commercial construction industry, rammed earth is receiving growing attention and becoming more and more popular with architects, builders and clients alike. In this short post, we tell you a little more about the technique. Rammed earth walls are made by ‘ramming’ a mixture of materials into place between flat, temporary panels called ‘formwork’. The panels are normally made of wood or plywood and they are clamped around the earth to make sure it doesn’t bulge when compressed. The materials rammed into the formwork generally include gravel, sand, silt and a small amount of clay. An additive like lime, cement of asphalt is often added to make it extra strong. The mixture is compressed inside the formwork by a mechanical ram and compacted to approximately 50% of its original height. The compression takes place in stages, usually in depths of 10cm to 25cm, and this is repeated until the top of the formwork is reached. This is the part of the process that results in the beautiful layers sometimes seen in rammed earth walls. After the wall has been completed, the formwork is removed and a surface texture can be applied, e.g. by wire brushing or carving. The wall is normally too hard to work on after about one hour. As the walls dry and harden (ideally in warm weather), the compression strength of the rammed earth increases to a maximum of 4.3MPa (620 psi). This is less than concrete but sufficiently strong for domestic buildings. Cured rammed earth has a high thermal mass. This means that it absorbs heat during the day and releases it at night, which reduces heating and cooling costs. Environmental impacts are also kept low if the amount of processing of rammed earth materials is kept to a minimum (i.e. artificial additives) and material is sourced locally where possible. Most of the energy used in the construction of rammed earth is in quarrying the raw material and transporting it to the site. The composition of rammed earth allows it to absorb and release humidity from the inside of a building. This improves air quality, particularly for people who suffer from asthma. Rammed earth is also inorganic, which means that it won’t decay and does not support the growth of mould. More than 30% of the world’s population uses earth as a building material, hence this technique is not new. Properly constructed rammed earth can also last for thousands of years, demonstrated by the many ancient structures built using this technique which are still standing around the world. It has received growing attention in recent years as the construction industry and its customers have a growing sense of the need for environmentally friendly and sustainable building practices. 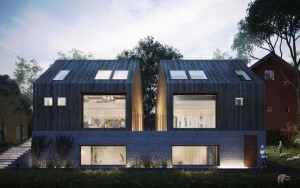 Not only does the technique offer opportunities for carbon-neutral building projects, the technique can be employed in a wide range of climatic conditions and for developing housing that would otherwise be constrained due to expensive construction techniques. It is a technique that we have been exploring at RISE Design Studio, particularly in our drive to use local, sustainably-sourced building materials. 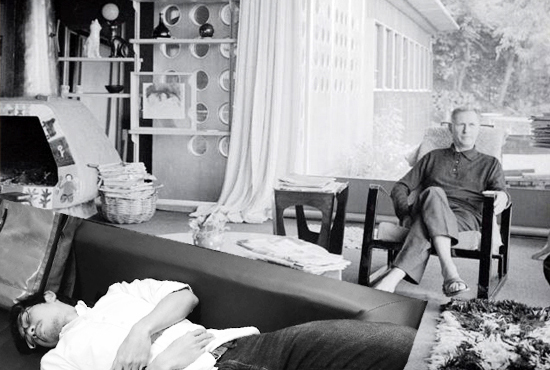 French architect and designer, Jean Prouvé (1902-1984), has been described as one of the most influential designers of the early modern design movement. Once quoted as saying “never design anything that cannot be made”, he combined engineering and design to produce a wide range of furniture and prefabricated architecture. An influential force among modern designers and constructionally-minded architects, we also take inspiration from his work here at RISE Design Studio. A apprenticeship in his teenage years with a Parisian metalsmith led Prouvé to become a master of of various metals. Opening his own workshop, Atelier Prouvé in Nancy, he became adept at working with wrought iron and steel at scale, creating numerous furniture designs and then opening his own factory. He fabricated lamps, chandeliers, and handrails, as well as the famous ‘La Chaise Inclinable’, the first reclining chair to use the technique of flat steel tubes, which allowed the chairs to be stacked. He collaborated with some of the best-known French modern designers of the time, such as Le Corbusier and Charlotte Perriand, and his early successes led to the mass-production of his furniture (tables, chairs, shelves, etc.) for universities, hospitals, offices and schools. Tables made via an innovative method of folding sheet material were described as having “the perceived lightness of bridges and the presence of architecture”. During World War II, Prouvé was commissioned to design prefabricated barracks for the French army. This allowed him to develop the structural system that became central to his later architectural designs. The roof and walls were supported by large A-shaped columns that a ridge beam could be slotted into. In the 1950s, Prouvé devoted more and more of his time to the challenges of prefabricated architecture. His own house, which he designed as a prototype, is now considered a major development in prefab housing and, even today, engineers can’t always grasp the complexity of the bracing and support system that he set up intuitively in the structures he created. His ‘demountable houses’ combined easy assembly and structural integrity that were used in a range of scenarios in a number of countries: durable housing for homeless war victims, manufacturers’ offices, and rural schools, to name a few. Many of Prouvé’s furniture pieces are still manufactured by a Swiss furniture retailer, and his prefabricated houses remain preserved and regularly displayed. In 2008, Prouvé’s ‘Maison Tropicale’ (developed in the 1950s to address housing shortages in French colonies) was assembled in front of the Tate Modern in London to coincide with an exhibition of his work at the London Design Museum. Since 2010, there has been reinvigorated interest in Prouvé’s prefabricated architecture. Many have been sold to collectors as installation art and, at a time when architects, planners and governments are becoming increasingly interested in addressing the issues associated with mass affordable housing, his ideas are being developed, adapted and modernised to suit modern day needs and increase their original material and economic efficiencies. Several well-known architects (Norman Foster, Zaha Hadid, John Pawson, Frank Gehry, to name a few) have turned their hand to designing and building boats, and it is now common to find boat building technology and materials (such as custom composites) in modern building structures. Floating architecture is also becoming more and more popular. There seem to be natural parallels between the skills of the architect and the boatbuilder, particularly in the crafting of a wooden structure to create a functional and beautiful end result. To the boatbuilder, ‘lofting’ is the creation of full-size topographical maps of a boat’s hull that allows the builder to make all the molds, patterns, parts and pieces accurately. The process of ‘laying down the lines’ is relatively similar to practices that go back to the 17th century, generating curved lines for the streamlined hull and keel of a vessel. Lines can be drawn on wood and the wood then cut for advanced woodworking. 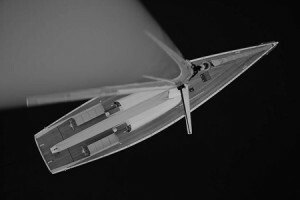 Today, boatbuilders, like architects, use computer-aided lofting to fine tune designs and produce a set of full-sized lines. Following architectural conventions, a ‘lines plan’ slices through the boat in several directions and can be combined with a ‘table of offsets’. This contains reference points used in a similar way to latitude and longitude on maps to allow the use of coordinates to find specific points on the hull. This then allows the full scale model to be built. Like architects, boat builders are focussed on what looks good. Subtle attention to detail, symmetry and proportion don’t necessarily make a boat float better but they do affect the appearance of the vessel. The ‘sheerline’ is the subtle and graceful curve that defines the uppermost edge of the hull. This is probably the most important feature on a boat and is often difficult to get ‘right’. Often, a 2D drawing of the sheerline will not look as attractive in three dimensions as the paper drawing cannot take into account real-life perspective. Simple things like how screws line up are also important. Lined-up slots impart understated elegance, while randomly aligned slots might look unattractive. Wooden boat building has been described as “the quintissential industry“. Over time, boatbuilders will have found that certain woods are more suitable than others, and that locating sources for materials can be a challenge. 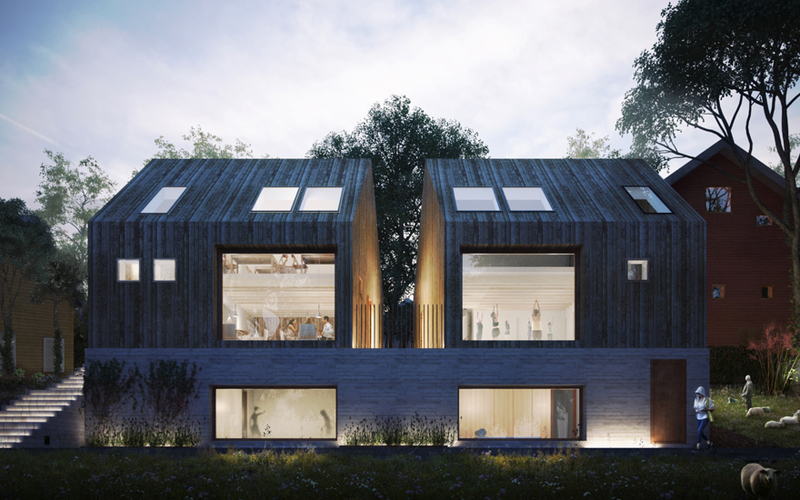 This is a challenge also experienced by the architect who wishes to uses local materials to retain the sense of place and context of the structure. One of our most respected architects here at RISE Design Studio is Peter Zumthor, the renowned Swiss architect. Winner of the 2009 Pritzker Architecture Prize and the 2013 RIBA Royal Gold Medal, Zumthor’s sensuous materiality and attention to place has inspired several of our architecture and design projects. Although he has only built around 20 projects worldwide, his work is widely acclaimed and sought after. In this short post, we reflect on the career of Peter Zumthor, the projects that he has designed, and how he wishes his work to be experienced. Peter Zumthor has been based in his studio, Atelier Peter Zumthor, since 1979. Situated in the Swiss mountain village of Haldenstein, Zumthor works with a small team of around 30 employees. In the past, Zumthor tried to protect himself from too many outside influences and gained a reputation in the media as being somewhat reclusive. Although he is quashing this image today, his practice remains somewhat rarefied as his clients are seen as ‘vehicles’ for him to realise his ideas and facilitate his works of art, rather than ‘clients’. Zumthor is well-known for his preference for simple, unfinished materials. Perhaps the most well-known work of Zumthor is the Therme Vals in Switzerland, which was completed in 1996. Built over thermal springs, the building is a hotel and spa/baths which is created in the form of a cave or quarry-like structure. To complement and ‘fit-in’ with the surrounding environment, the baths are situated below a grass roof and partially buried in the hillside. The Valser Quartzite slabs used in the project were quarried locally and the respect for the stone became the inspiration for the design. Zumthor is also celebrated for the Kunsthaus Bregenz, built in Austria in 1997. The museum’s minimalist design allows the space to be adapted to suit the art that is on display, redefining the relationship between art and architecture. Other notable works include the Swiss Pavilion at EXPO 2000 in Hanover (built of stacked beams of larch wood and Scots pine and held together by steel rods and springs) and the London Serpentine Gallery temporary summer pavilion in 2011 (at the heart of the pavilion was a specially created garden to allow the audience an emotional experience, with time to relax, observe and talk). The work of Peter Zumthor is all about how a person experiences the sensation of a building. With buildings ‘grown out of their place’, as if from the ground of forest, the orchestration of light and sound, as well as the touch and smell, are all vital, tactile qualities which create a minimalist feel. The focus on experience is embodied in the attention to detail paid to the interior of the building, on a par with the design of the exterior. When the exterior can ‘rule all’ in many contemporary architecture projects, this is a welcome reminder of the importance of considering the experience of detail and looking at things closely, something that we are currently researching in our own work. We recently attended a CPD tour organised by RIBA to the Ibstock brick factory in Chailey, near Lewes in Sussex. It was fascinating to see process of traditional stock brick manufacturing in one of the last remaining clamp-firing factories in Europe. We highly recommend a trip to the factory if you’re looking to source traditional stock bricks. This short post tells you a bit more about what we learned on our visit. Clay products have been manufactured in Chailey for over 300 years, making it one of the oldest factories still in production in the UK. Its product range has changed over time and it now produces high quality, clamp-fired stock bricks and pavers with a range of colours and textures which give a unique charm. 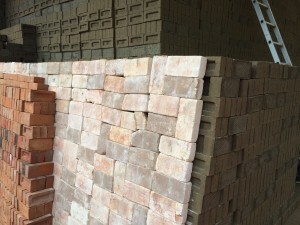 Bricks are known for being made in Chailey since the early 17th century. The current factory was built in 1946 in order to take advantage of modern production processes and the post-war building boom. The current owner, Ibstock Brick, acquired the site in 1996. At Chailey, weald clay is extracted from an onsite quarry behind the factory during the summer months. There are three different seams of clay in the quarry, all with different drying and firing characteristics. Clay is dug from a stockpile each day and fed into the factory, delivering a set amount of clay each hour. Clay is mixed with sand and pulverised fly ash, which help with the drying process, and with a blend of coke breezes, which is the fuel that fires the bricks. All the material is fed into a wet pan, where it is mixed and ground together and water is added. The material is forced through grids in the floor of the wet pan and onto a conveyor, after which it falls between two counter-rotating drums, with a gap of only 3mm between them. This is so that a small but consistent grade size is achieved. The material is then mixed in a double-shafted mixer where two shafts churn the mix to ensure and smooth and workable consistency. The mix is then taken to a kettle where it is stored before being turned into bricks in a molding machine which is capable of making 12,000 bricks per hour. The excess clay is struck off before a palette is dropped onto the bottom of the bricks. Bricks are piled in stillages which are then put into the driers, where the bricks are dried over a 23 hour period. There are five dryers and each one holds 24,192 bricks. 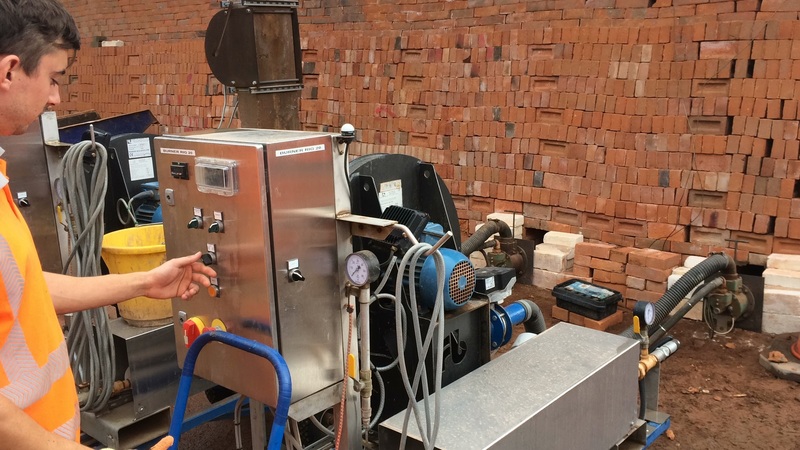 The temperature in the driers is slowly increased up to 110 degrees and approximately 17 tonnes of water is removed from the bricks. A clamp is ‘a carefully constructed stack of bricks’ in a large shed similar to a cowshed. Before going to the clamp, the dried bricks are inspected for defects and stacked into piles of 780 bricks (weighing 1.8 tonnes). These bricks are then laid on the floor of the clamp by hand by a setting team. 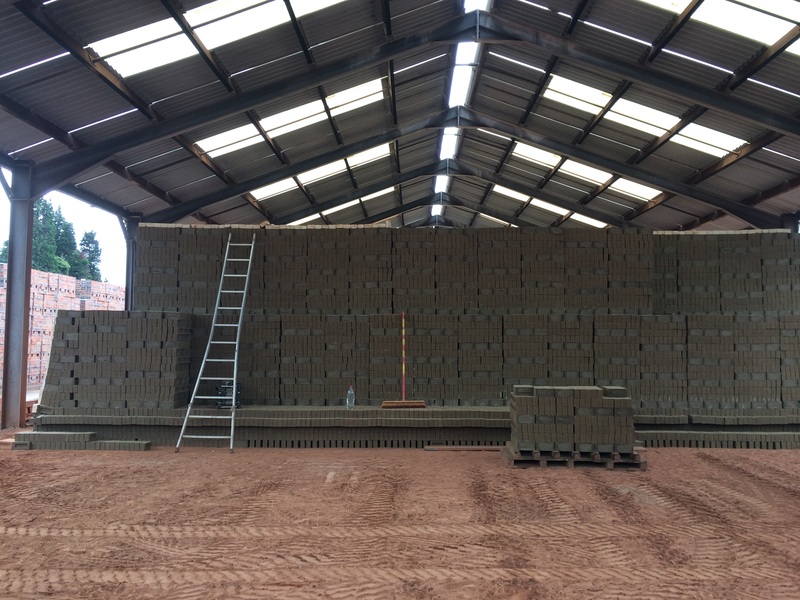 Fire holes are built into the clamp before all the bricks are laid on top and the clamp is then covered in refractory insulation bricks and casing bricks which help to insulate the clamp during the firing process. Each clamp holds between 750,000 and 800,000 bricks and takes three weeks to build. Gas burners are used to ignite the fuel which was mixed into the body of the bricks during the clay preparation process. The bricks fire at over 1000 degrees centigrade and only start to cool down when all of the fuel has burnt out. The entire firing cycle takes three weeks. When the bricks have cooled sufficiently, the bricks are packed up by hand onto pallets by an eight man team. There is a strict sorting code and the bricks are sorted according to their quality and colour and then hand sorted into packs of 370 bricks. It takes approximately two weeks for the team to pack up a clamp. 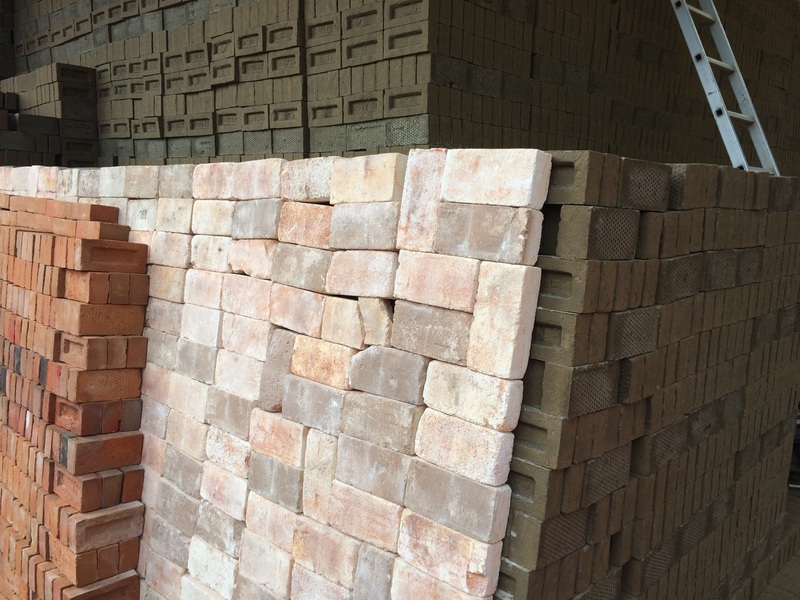 Chailey manufactures its range of distinctive bricks in both 65mm and 50 mm sizes and any of the bricks can be blended to create products to match up to existing brick work. Or, bespoke blends of bricks can be created. You can read more about the bricks made at Chailey on the Ibstock Brick website. What is Building Information Modelling (BIM)? What does it cost to extend your home?